I made these as sides last night for dinner, and they turned out so good. 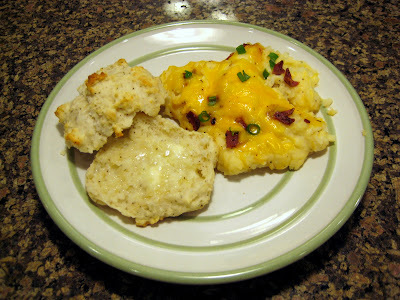 The biscuits are basically really flavorful drop biscuits, and super easy to make. They really didn’t take much time at all to prepare. So I highly recommend the biscuits, being that I was raise on good old fashion country food, and these biscuits were awesome. The baked potato casserole was super yummy too. I mean honestly, how can you go wrong when you put potatoes, sour cream, cheese, and bacon together. This recipe calls for turkey bacon, which I really liked because the bacon was a little more weight friendly, and didn’t overpower the rest of the potatoes. Preheat oven to 425 degrees F. Combine flour, baking powder, salt, pepper and Parmesan in bowl of electric stand mixer. With mixer on low, cut in butter until mixture resembles coarse crumbs. Add buttermilk; stir just until ingredients are moist and well combined. Drop 1/4-cup mounds of dough onto parchment-lined baking sheet. Bake 12 to 15 minutes or until tops of biscuits are golden brown. Remove from oven; let sit 3 to 5 minutes before serving. Preheat oven to 350 degrees F. Grease 2 1/2- to 3-quart casserole dish. Return potatoes to saucepan; add evaporated milk, sour cream, salt and pepper. Beat with handheld mixer until smooth. Stir in 1 1/2 cups cheese and half of bacon. Spoon mixture into prepared casserole dish. Recipe for Biscuits from KitchenAid Baking Basics Techniques for Perfect Baking. Recipe for Casserole from Toll House’s Nestle Holiday Favorites.